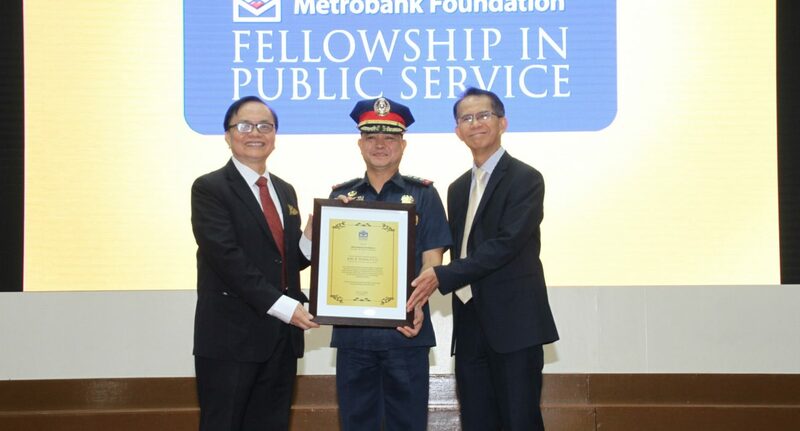 The Metrobank Foundation, Inc. (MBFI), in cooperation with the Philippine National Police (PNP), held the inaugural lecture for the “Metrobank Foundation Fellowship in Public Service” on June 19, 2018 at the PNP Multi-Purpose Center in Camp Crame, Quezon City. Speaking before members of the PNP was Cebu City Police Office city director Police Senior Superintendent Joel Bargamento Doria—a recipient of the Metrobank Foundation Outstanding Filipino Award in 2017. The “Metrobank Foundation Fellow in Public Service” title was conferred to him “recognizing his more than two decades of outstanding contribution to serve and protect the Filipino people and for his commitment to tackle criminality without losing respect for morality and for ensuring that the quest for justice does not in any way infringe the pursuit of peace” the recognition plaque states. “After recognizing the Outstanding Filipinos in 2017, we thought of bringing to the fore their professional achievements and personal life stories. It is our belief that achievements, which resulted to positive change, or innovations which addressed major societal concerns, should be highlighted and widely shared. Hence, we decided to provide an avenue for these stories to be heard, hoping that others will replicate or even surpass these outstanding achievements,” said MBFI president Aniceto Sobrepeña. “We hope that our future police leaders gain the insights and inspire their individual journeys in the pursuit of exemplary public service” he added. PSSupt. Doria shared their unit’s best practices in support of the Anti-Illegal Drug Campaign and Anti-Criminality Crusade of the institution. Dubbed as Oplan POKEMON (Pakigbatukan Og sumpoon ang Krimen ug ang Epekto sa illegal nga drugas nga Makadaut Og makaguba sa Nasud or Fight and Eradicate Crime and Illegal Drugs that are Detrimental to the Nation), it is a modified one-time-big-time type of police operation, conducted simultaneously by all Cebu City police stations in a randomly picked day of the week. Unique to this is its comprehensive breadth as it targets all types of street crimes while employing crime prevention activities such as police patrol and police-community relations activities. “We needed a plan that would cause the public to buy-in to our efforts – something that does not require unnecessary loss of lives but still cause unrest to criminals and drug peddlers. During that time, the mobile game Pokémon Go was raving the news and social media. Everybody knew what Pokémon Go was. What we needed was to connect the drugs war with the mobile game that everybody loved,” shared PSSupt. Doria. The result was a success that out of the 62 Oplan Pokemon operations that ran from August 2016 to March 2018, they were able to arrest 4,266 persons for various violation (but mostly illegal drugs), confiscated 6 kilos of shabu, recovered 101 loose firearms, pulled the plug of 666 illegal gambling machines and recovered 211 thousand pesos cash (proceeds of illegal activities). In his 26 years of service to the PNP, he took on challenging assignments on various units such as the Special Action Force, Highway Patrol Group, Police Regional Office 3, and at the National Headquarters in Camp Crame. He is also responsible for the neutralization of various criminal groups and high value targets in many of his assignments. He graduated as part of the “Taga-Pagpatupad” class of the PNP Academy in 1992, where he earned his Bachelor of Science in Public Safety. He further pursued both his Master’s Degree in Peace and Securities studies and Doctor of Philosophy in Peace and Security Administration from Bicol University. The Metrobank Foundation Outstanding Filipinos are recognized for rendering service above and beyond the call of duty. Their accomplishments inspired and influenced others in transforming communities through a lasting positive impact on people and the country.